You might not immediately think that Winston Churchill and Enoch have much in common, but this week’s much anticipated arrival of B4 (not B4 time!) reminded me that the same lesson can be gleaned from both. 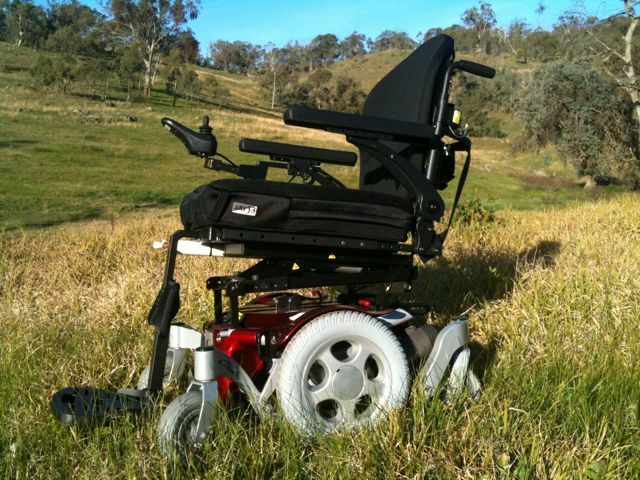 B4, the fourth incarnation of my original wheelchair, ‘Bugger’, is terrific! Made to order in America and then fitted out locally, B4 is a marvel! Centre wheel drive, fast, sleek, and of course red. B4 is amazingly nimble around the house, with a tight turning circle that allows us to access the smallest rooms. A cunning system keeps all six wheels constantly on the ground, making the ride smooth and stable indoors and over rough terrain. The open road is another thing altogether: we rocket along at a good 10 km/h with a purported range of about 15km. I’m keen to put that to the test! She is worth more than our car, and yet in our day and age the greater part of her cost was met by various departments of our public health system. It’s overwhelming. By rights the new chair probably could have been home-delivered; but my restless independence spoke up, and I quickly volunteered to make the trek by public transport up to the showroom to exchange the hired B3 for the shiny new B4. It’s a good hour and a half on three busses – each way – but a mission on public transport is like the call of the wild! And what a delivery it turned out to be. Like all sensible fathers, I maintain a prudent silence regarding the reported trials of childbirth; but nonetheless there was something about B4’s delivery that seemed to me almost obstetric. Too much emotion, and way too much hard work. I well recall an occasion from my childhood when our extended family took delivery of three brand new Volvos on a single day. It was thrilling, even for a child, and surreal as well. The emotions that attend a new car are almost exactly the opposite of those that come with a new wheel chair. A new car is an exciting achievement, something to crow about. A new chair smacks of confinement. A new car carries promise, inspiring confidence in the good times ahead. My new chair instilled in me a sense of panic. What if it’s uncomfortable / inoperable / troublesome / a lemon? The technician and I laboured for two full hours of adjustments to every imaginable function of the chair. Red eyed and depleted, I finally departed the delivery room with the new arrival. On the way home I found myself looking in shop windows to see how we looked together, B4 and I. It’s startling to see yourself reflected in such circumstances: hard to look at and harder to look away. My own image akin to the glimpse of deformity which both repels and attracts the voyeuristic eye. After weeks of public outings I still don’t quickly recognise my own reflection. Surely that’s not me? How the heck did that happen? Decades before Churchill became the famed wartime leader of England, a British military officer declared that the 25 year old possessed the two qualities necessary to one day become Prime Minister: “genius and plod”. Genius is given rarely, and to few. But plod – well, that we can all aspire to. I was usually last in line at the door to my infant’s school classroom where we doffed our caps to greet the teacher. I don’t know why, I just seemed to always wind up there. Eventually though I finished school right near the top of the pile. The secret, not that it’s much of a secret, is to keep plodding on. One foot after the other. Or one wheel behind the other; if that’s what it takes. This is where old Enoch fits in: a poignant tale from ancient biblical history of a man who, it is said, “walked with God; then he was no more, because God took him away”. The original plodder, Enoch discovered that the path to heaven is one of companionship and constancy. Just stay close; just keep walking; just see where you end up. There is simplicity, purity, even holiness to persistence. A Pilgrim needs only to take the next step, absorbed not by the destination, but in the journey. Fear comes from gazing too far down the unknown path, and regret from a backward glance. Peace is found in doing the next thing. And then the next, and the next after that. Since the delivery we are seldom far apart, B4 and I. There’s even a night feed we do together now and then: tea in the wee small hours of sleeplessness. B4 has been home for almost a week, and I think we are getting to know one another. I’d say we are even bonding! We might not be in quite the same class of plodders as the two venerables; but I’m mindful of Churchill’s signature acronym, KBO: “Keep Buggering On”, with which he is said to have ended many a wartime conversation. A little rough round the edges perhaps, but like the original christening of Bugger, the language is appropriately inappropriate. It’s a good motto for B4 and I. However you do it, by foot or by wheel, KBO! Go well brother, I look forward to reading more stories of your adventures with B4. So Glen, you did beat last year’s time, even with a ‘dicky knee’. Well done mate, and thanks for your enthusiasm for the blog. KBO … As they say!